This is the third in a series of Spotlights on Atlas-Age Marvel Monsters. American Scientist "Bob" is conducting research in Transylvania when he feels the trembling of an earthquake taking place 500 miles away. He volunteers to go to the area to determine the cause of the quake, and finds a strange, fearful populace who refuse to even acknowledge the tremor. In the center of town Bob discovers an enormously tall, circular wall, but the villagers refuse to explain it. So he begins climbing -- when suddenly he's knocked flat by a burst of electricity! The next day he rents a plane and tries to fly it over the wall-- only to have it blasted and broken up in midair! Luckily, when he bails out he manages to land in a haystack... Will the secret of what's behind the wall ever be revealed?!? Finally, after consulting an old map, Bob finds an abandoned mine tunnel and burrows under the wall, where he finds a weird kind of construction zone. There, hypnotized villagers ramble about with complex electronic equipment, toiling away in front of a large pile of earth, while a "strange high-pitched voice" orders them to and fro. The workers mutter one-liners about something called the "kind" and "wise" "leader," Spragg. Luckily, Bob's metal Spelunking helmet shields him from the powerful hypnotic forces, and he begins searching for the source of the voice. Suddenly-- ("The hill – it’s starting to throb – to pulsate!!") -- two slits appear in the mountainside, widening into a set of fearsome eyeballs-- and the voice intones: "Behold... the all-seeing eyes of your master!!" 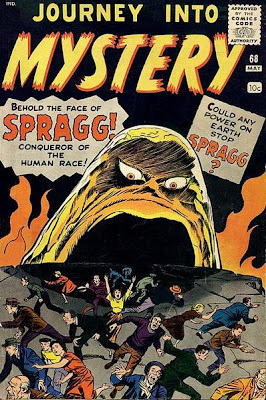 Bob is stunned by his fearsome revelation: "The hill itself is Spragg!" 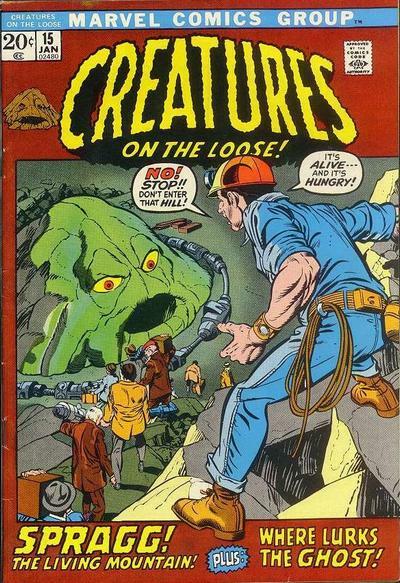 By pretending to be one of the hypnotized workers, Bob discovers both Spragg's origin (He and his kind were formed from "harmless spores floating aimlessly in space and time" that managed to find a home deep within the Earth's crust) -- and his evil plot to enslave the whole human race through his mesmeric powers. Turns out, though, that Spragg's amazing mental capacity was damaged by the earthquake that brought him to the surface, and, for this reason, he has been commanding the humans in his service to build an enormous electronic dynamo that will boost his brain power. Working through the night, Bob manages to come up with a brilliant plan to save the villagers and all of humanity. But will it work? Can Spragg the Living Mountain be stopped? I won't say how, but yes, Bob manages to win the battle-- though not the war... In the end, Spragg lives to fight another day (For some reason, years later, the powers-to-be at Marvel thought it would be a good idea to bring him back-- to cross swords with... She-Hulk). "Spragg, Conqueror of the Human Race!" 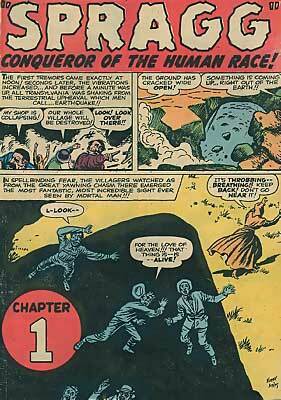 Images from the great Monster Blog, Comic Coverage, and the Grand Comics Database. NEXT: GROTTU, KING OF THE INSECTS!